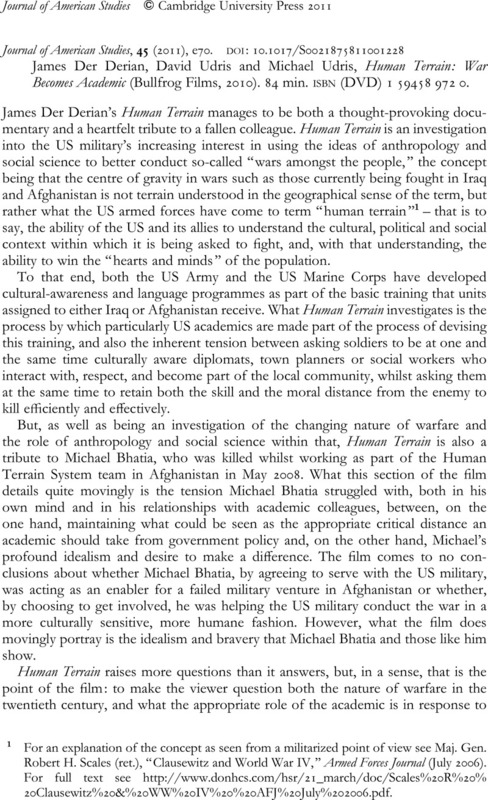 James Der Derian, David Udris and Michael Udris, Human Terrain: War Becomes Academic (Bullfrog Films, 2010). 84 min. isbn (DVD) 1 59458 972 0. 1 For an explanation of the concept as seen from a militarized point of view see Maj. Gen. Robert H. Scales (ret. ), “Clausewitz and World War IV,” Armed Forces Journal (July 2006). For full text see http://www.donhcs.com/hsr/21_march/doc/Scales%20R%20%20Clausewitz%20&%20WW%20IV%20%20AFJ%20July%202006.pdf.